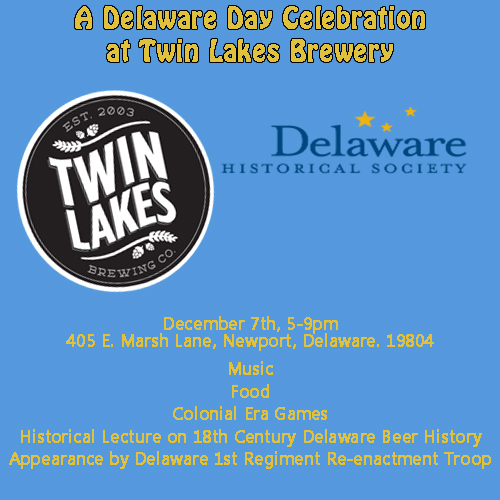 December 7th, come celebrate Delaware Day with Twin Lakes and the Delaware Historical Society as we make a state-wide toast to a true Delaware patriot, Caesar Rodney! 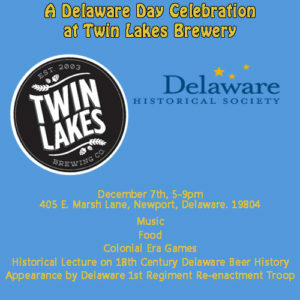 We will have food available from Fat Ricks BBQ, a historical presentation from the Delaware Beer Expert John Medkeff Jr. , and an appearance by the Delaware First Regiment re-enactment troop, who are bringing an 18th century vibe to the tasting room including props, games, and music to make this a truly authentic historical experience. It’s going to be a great time, so come on out and enjoy yourself while showing some state pride and getting a little historical knowledge while you’re at it! This entry was posted in Tasting Room Event on December 7, 2017 by Edward Poore.